On June 7, the Windy City Rubber Ducky Derby officially kicked off its fundraising season with its annual event at the Chicago Maggiano’s. Emceed by Dawn Hasbrouck and Jeff Herndon, co-anchors of Fox News Chicago, corporate and friends and family teams learned about selling duck adoptions, plus the new tools available to help their teams achieve their fundraising goals! 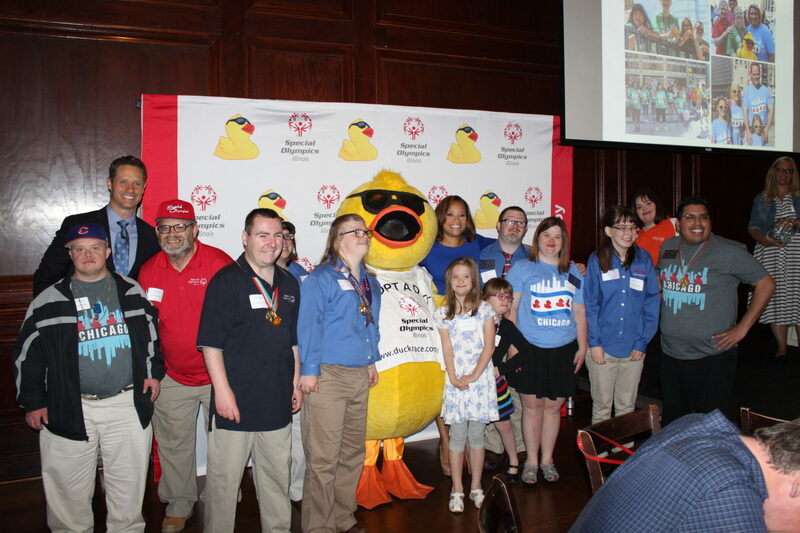 More than 100 team captains and Darling Ducklings (Special Olympics Illinois Athlete fundraising team) attended the event. The team captains were treated to an inspirational speech by Ana Boyd Cooper of Durham School Services, last year’s top corporate fundraising team. Ana encouraged the teams in the room to catch them if they can! Durham School Services has held the title of top corporate fundraising team at the Windy City Rubber Ducky Derby for the past 9 years and has participated as a team for 10 of the 11 years the Derby has been held in Chicago. Durham has sponsored the Duck Derby for the past five years, and is a great partner throughout the year. They participate in multiple fundraisers and donate busing services to athletes and fundraising participants. Following Ana was a truly inspiring and motivating speech by this year’s Windy City Rubber Ducky Derby Ambassador Allie Reninger. 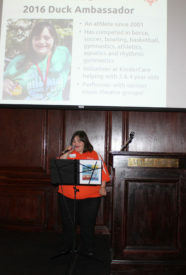 “I have benefitted so much from my participation in Special Olympics. When I was a little girl, there were some who doubted I would ever learn to walk. At Special Olympics, they knew that someday I would run. When I was a little girl, I used sign language to communicate and some doubted I would ever learn to talk. At Special Olympics, they made me a Global Messenger and knew that I would someday use my voice to help others. Today is that day. Today I want to use my voice to encourage all of you to sell ducks and use our collective voice to raise money for Special Olympics. We have the opportunity to give back to the organization that has given so much to all of us (pointing to other athletes in the room). When we take the Special Olympics oath, we pledge to be brave and do our best. When we step onto the field or get set in the starting blocks for our competitions, we give it our all. We all need to do our best and give it our all to sell ducks and support this wonderful organization. With that, the teams and sponsors were ready to start the 2016 duck adoption season. The Windy City Rubber Ducky Derby will take place on Aug. 4 in front of the Wrigley Building at 400 N. Michigan Ave. Please join us for festivities beginning at 10 a.m. and the race beginning at 1 p.m. when the Ducks will be dropped form the Columbus Street bridge into the Chicago River. Thank you to our sponsors, Jewel-Osco, Chicagoland and Northwestern Indiana Chevy Dealers, TD Ameritrade, Blue Cross Blue Shield Association, Durham School Services, Lakeshore Recycling Systems, Big Ten Network, Dunkin’ Donuts, Illinicare Health and Hollister. This year’s media sponsors are Fox 32 Chicago, The Chicago Sun-Times and iHeartMedia stations Big 95.5, Kiss FM and MyFM.